This year it sure felt like the Petaluma Spring Antique Faire came earlier as I remember it happening in May but, no, it came as scheduled at the end of April. It was a breezy, cool, sunny day so it was really perfect weather for such an event. 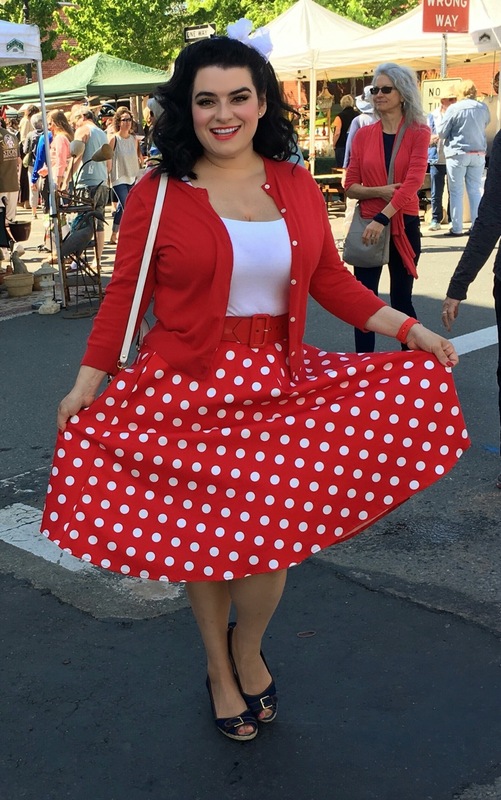 I decided to wear my pinup girl rockabilly red polka dot circle skirt by Hemet and sold at Inked Boutique. 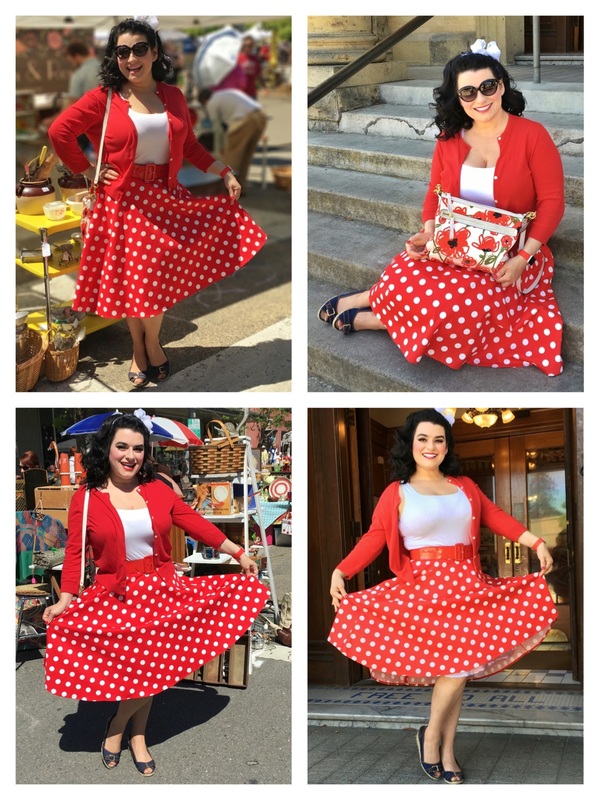 I am wearing the XL but this skirt has part elastic in the waistband and is stretchy so if you want a firmer fit then I’d suggest sizing down. I wanted the skirt to be the main focal point so I added a simple white tank and red cardigan. I had my hair simple and tied with a sweet white sheer bow. I did have my winged eyes and red lip and for antiquing I like a purse that can worn cross-body so I got to wear my pretty Poppy flower Coach bag that my husband gave me as a gift a while back. I was ready!! I will say that folks were so sweet to me and kept telling me how great I looked. The bright colors of this outfit are sure eye-catching!! Folks appreciate the Pinup look. We got to the fair mid-morning. It was in full swing. The day was gorgeous. We walked the show, went from booth to booth, vendor to vendor. The fair has something for everyone and takes up several blocks in downtown Petaluma. Some of our favorite were not at the show this year, and we wondered why…. we always look forward to visiting the booths of our favorite vendors but, not this year. There seemed to be a whole lot more shoppers than in years past so that is great for the show. A lot of dogs too, the show does bring out folks and their dogs so you constantly have to dodge baby carriages and dogs. Since the weather was so perfect I’m guessing that is why so many more shoppers came out. Dealers seemed to have an abundance of vintage garden ornamentals for sale this year, it felt like everywhere you looked there were iron fences and metal sculptures mixed with crates and plaster yard ornaments. We did end up with a neat vintage 50s metal fan with turquoise base, and it works!! I also got a lovely vintage flamingo planter for my ever-growing collection of vintage flamingos. We had a nice lunch of fish and chips at a super cute little place a block or so by the show. My hubby was so sweet and snapped pics of me throughout the faire. Next show is the Fall show in September so we will be back. Right now I have a lot of projects I am juggling with modeling gigs, magazine shoots and of course work but I really want to try and get up to Portland for the big July antique show and spend a couple days visiting my twin sister and her family. Spring has been busy and I will post up soon all the magazine I have had the opportunity to appear in as I have been getting a lot of questions from you all. Hope you all are doing great! !